Join the discussion on our forums! 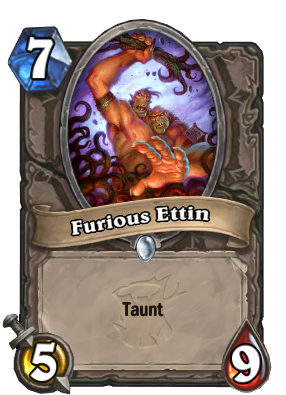 Come discuss Furious Ettin over in our dedicated Furious Ettin discussion topic. Who's to bet we'll see this card a LOT in arena? I rate this card 5/9. Bog Creeper was top-tier in Arena and even saw fringe constructed play in Bogchamp Shaman. I'd argue that this card has a slightly better statline to boot. Not bad cookies. At his graduation he was voted "most likely to become a pack-filler"
Captured Jormungar, but with a tree. Trade your beast tag for a taunt. Hunter does not approve! Would have been awesome if they used the Jormungar instead of the tree. Good as an arena card, somewhat viable in Lady in White decks, but i doubt that will take place really in anywhere other than arena. More decent common taunts for arena mode! That gives us total of 2 ettins now. Looking forward for next ones. Bog Creeper replacement for the new standard cycle. new Bog Creeper i like this card for arena. Sure this is a Baku card.